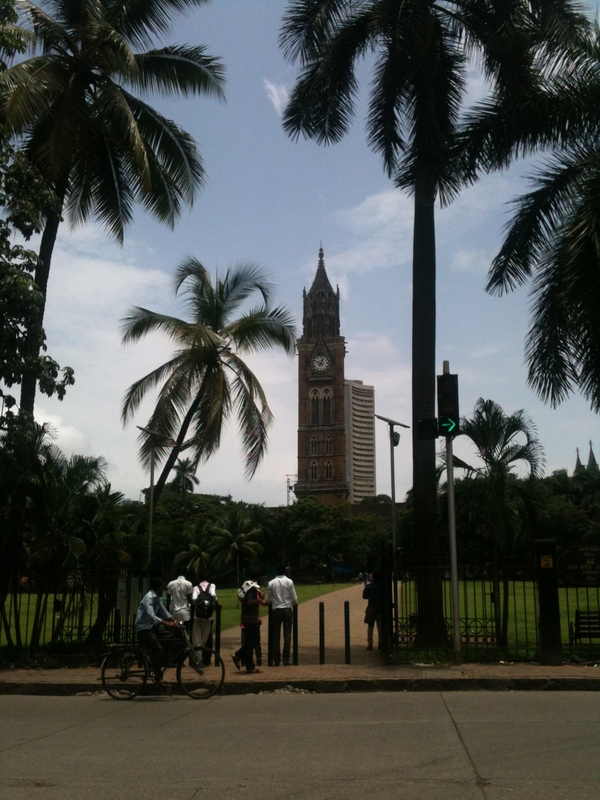 Since the early 18th century Bombay began to rise as a hub of trade and various other industries. To accommodate this flourishing commerce the city began to change. The administration reclaimed the lands that was submerged in the seas. Filling of the breaches and construction of bunds and roadways to join the seven islets into a single island was completed by 1838. The immensely growing cotton trade during the 1860s boosted this maniacal construction drive through the city. By 1872 the administration has acquired four million square yards of new reclaimed land. The pivotal role for transforming the city’s architecture was played by Sir Henry Bartle Edward Frere, who was the Governor from 1862 to 1867. Even though his tenure lasted for only about 5 years, he is known to have done the most to change the city from imperialistic to urban modernity. He ordered the demolition of the rampart walls opening up vast areas. This also helped the military to have an unobstructed view from the fort. After this land was freed from the military the administration alloted the land for making public and government buildings and roads. This land was divided into four large maidans. Azad and Cross maidans in the north, Oval and Cooperage maidans in the south. 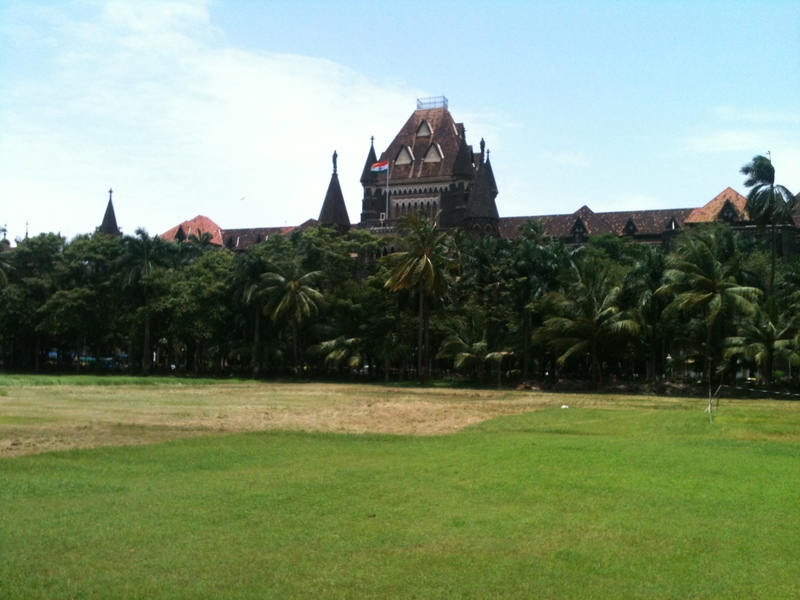 This magnificent Gothic Architectural style Bombay High Court was designed by British engineer Col. J.A. Fuller. The construction was carried on between 1871 to 1878. The court went into session for the first time in 1879. 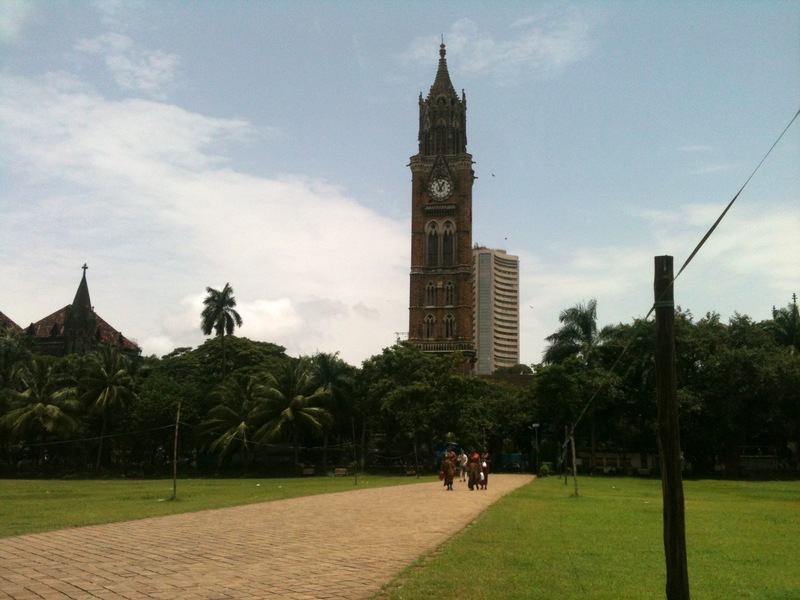 This is the Rajabai Tower which is located inside the Fort campus of the University of Mumbai. It is modelled after the Big Ben in UK by Sir George Gilbert Scott, an English architect. 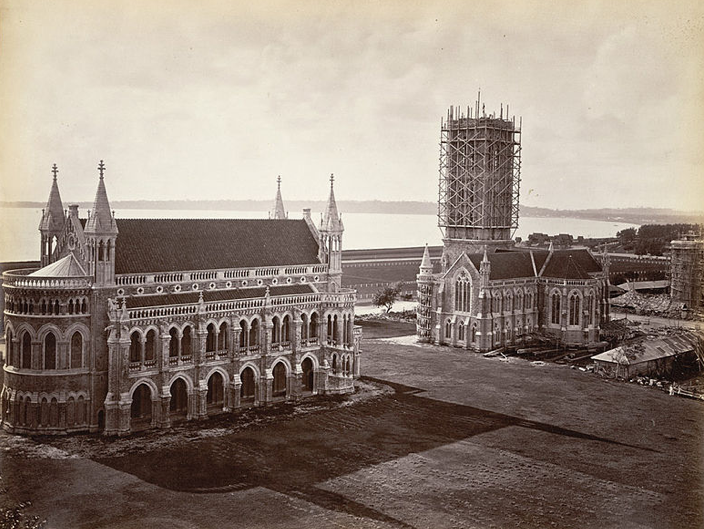 The work started in March 1869 and construction was completed in November 1878. 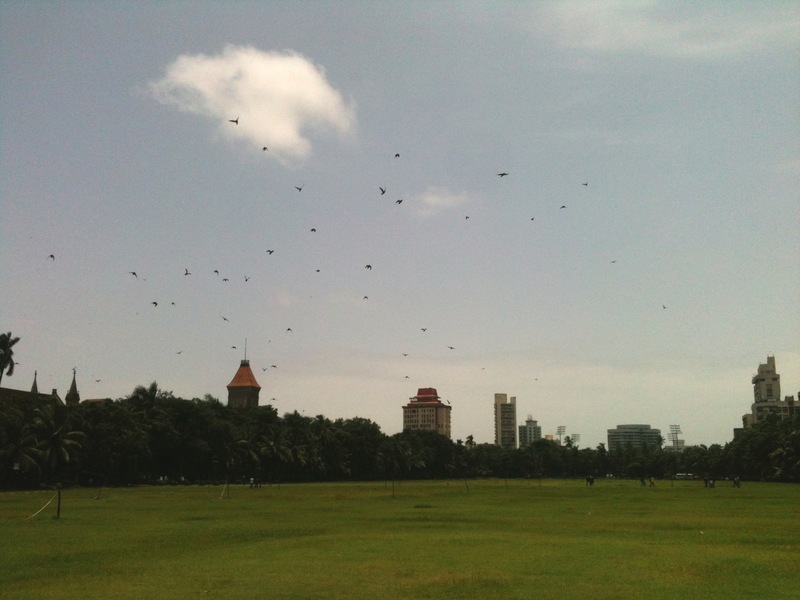 It became the tallest tower in India at 85 m.
This is the entrance into the Oval Maidan. On a sunday morning and also because this is monsoon the whole of the part seemed desserted and lush green. 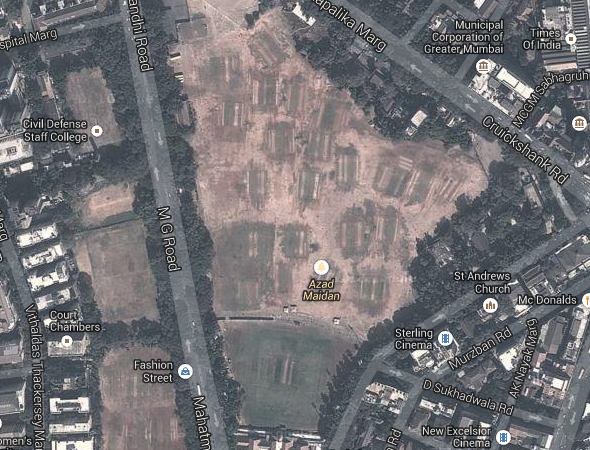 This is the triangular Azad maidan. Cross maidan was formerly known as parade ground. The name is derived from the Cross that was built when the Portuguese ruled. 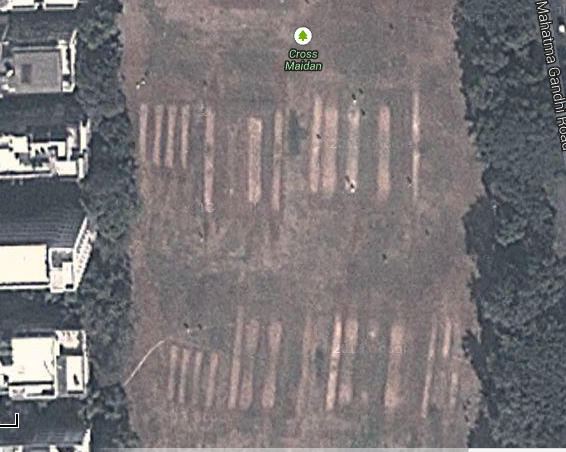 If you look at the picture closely you will see the numerous cricket pitches. 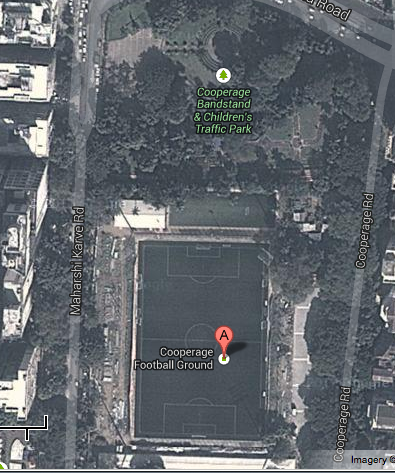 This is the Cooperage Football stadium. The stadium is undergoing renovation since a year. The new stadium will have a seating capacity of 30,000 seats. Besides this ground is the Childrens’ Traffic Park. 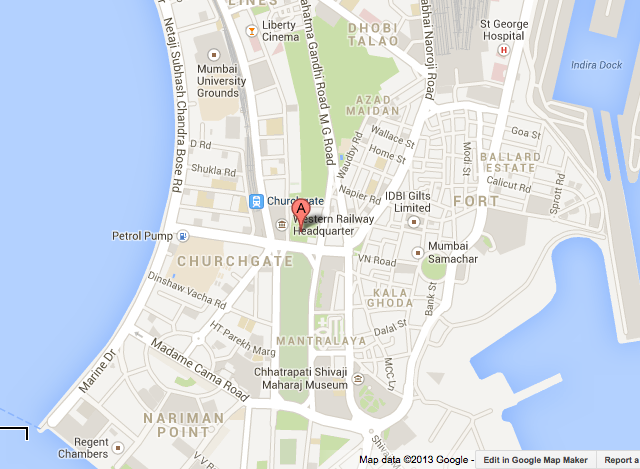 This is the story of the great Esplanade of Mumbai. Hopefully these vast open spaces of recreational grounds remain unchanged for generations to come.